Meghnad Saha Institute of Technology is back with the Seventh Edition of its Annual Techno-Management Fest, PARIDHI organized by the technical wing of the college, MEGATRONIX! We at Megatronix believe that, one never changes things by fighting the existing reality; to change something - one must build something which makes the existing model obsolete. Hence this PARIDHI is newer, better and mightier! With an all total of 45events, PARIDHI brings forth an opportunity for students to test themselves against a vast range of challenges. It is an opportunity to not only compete against the toughest teams in the country but also to win exciting prizes after the heart whelming victory. 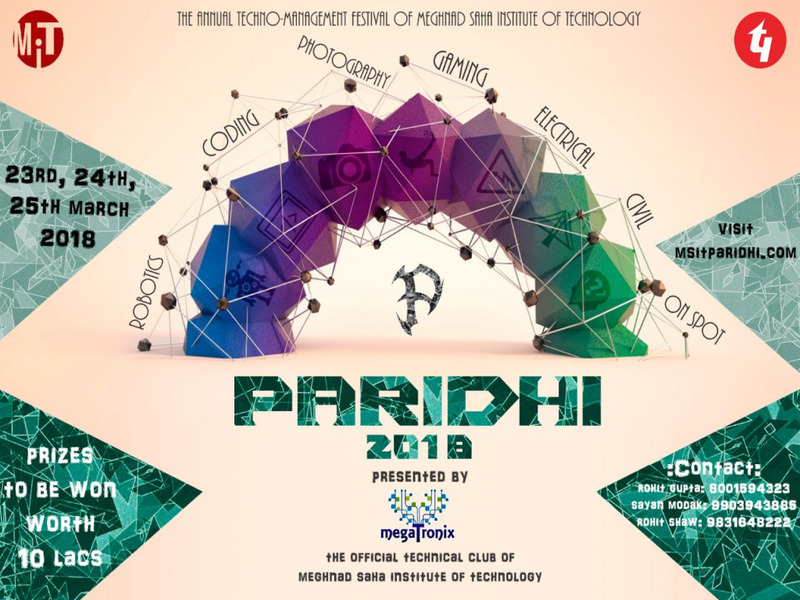 Megatronix, the Technical Club of Meghnad Saha Institute of Technology cordially invites each and every one of you to the finest Technical gathering of the season, PARIDHI2018! This season, let us all gather together and feel the essence of technology by applying it in the best way possible. So step out of our comfort zones and put your innovative minds to use. This year, push your limits and be at your competitive best to earn beautiful rewards and memories. So come over and give a tough fight because Harder the Battle, Sweeter the Victory. Paridhi 2017 was held from 18th March to 20th March 2017, with a total participation of over 3000 students from 50 colleges and offered Rs 6lacs as prize money.